During the last 10 years, the Indonesian government has issued many mining licenses with the argument of increasing the country’s economic growth and competition at the Asian and at the international level. According to data from the Ministry of Energy and Mineral Resources, there are approximately 10,918 mining licenses issued by central, provincial and district governments. Moreover, there are as many as 41 licenses for Contract of Work and 75 licenses granted especially for coal mining, with different extension of hectares leased to national and multi-national corporations (1). Mining licences have been granted across the country. In the Sumatra region there are 3,058 licenses, 3,907 in the Kalimantan region, 1,591 in the Sulawesi region, 438 in the Maluku Islands region, 245 in the Papua region, 467 in the Bali Nusa Tenggara region and 1,334 in the Java region.The environmental damage from this expansion has also occurred everywhere. It is not only in the forests or community land but also along the coasts and on the small islands of Indonesia. The mining extraction and production target is increasing every year, as does the rate of environmental degradation. 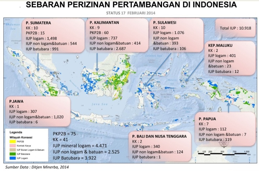 The damage caused by the corporate mining sector already covers all regions in Indonesia. “Artisanal” mines, which have also been increasing ever faster throughout the country, are also causing damages. Mines generate problems not only during the extraction and processing of the minerals but also during the first phase of operations, when they already affect the production areas of peasant and fisherfolk communities. These communities are often exploited by the companies and end up expropriated. The problems related to mining are much the same in all the places in terms of type and characteristics. They include the criminalization by the state apparatus of local populations resisting the projects and the devastating ecological damage which create adverse impacts to the environmental conditions and to the livelihoods of people. The Borneo Island is a very worrying example in terms of the ecological damage because of the impacts of the continuous coal extraction to meet the world’s coal demand – as well as for the national still coal-dependent energy demand. Indonesia’s coal production continued to increase until 2014. Successive Indonesian coal production data for the last 5 years showed that in 2010 its production amounted to 325 million tons, 371 million tons in 2011, 386 million tons in 2012, 421 million tons in 2013, 435 million tons in 2014 and the Indonesian government’s target for 2015 is 420 million tons. After depletion of the extracted mineral or minerals, what is left then is also a threat to communities, because former mine sites are abandoned without any attempts of rehabilitation of the areas or proper closure of the mine pits. In Samarinda City, West Kalimantan, for example, some pit mines already took the lives of people because the stagnant water covering the mine pit is then used as a small lake and playground for children. So far, already 10 children died while playing and swimming in the hole. Even though this has happened again and again, the local governments and the companies that have left the sites do not take any action to prevent such events, by for example, closing the hole immediately or providing security around the area so that people no longer can access the site. The Bangka Belitung Islands, the largest tin suppliers for the electronics industry worldwide, has also caused suffering for local fisher peoples because the tin mining activities are carried out offshore, in fishing territories. The biggest company that still operates until today is “PT. Timah Tbk”, a state-owned company which continuously expands its offshore mining activities, together with several other private companies that conduct offshore tin mining in areas used by fisherfolk for small-scale fishing. It is estimated that approximately 3,000 suction dredges operate around the Bangka Island. Several fisherfolk communities have often protested, targeting the government and the company because their livelihoods are affected: Their incomes decrease and the potential fish stock available is put at risk. They even face problems to fish just to meet the food needs of their own family. Besides, the coral reef ecosystem is severely disturbed and its function as a place for spawning is also affected due to the increasing turbid seawaters with mud and sediment that covers the coral reefs. Conflicts are also increasing at Sulawesi Island, since the company is using the strategy of inciting and creating clashes among local residents. For this reason, the state security apparatus has been brought to the area to protect the company.Nationally, the land covered by the mining sector has reached 3.2 million hectares and concessions are owned by 1,755 companies whose shareholders are both national and multi-national. For WALHI, an Indonesian environmental NGO, the biggest problem with mining companies is their predatory environmental destruction as well as their mutual “collaboration” with the government. The ecological disaster caused by mining activities is huge, for example flooding due to the decrease in the water catchment area; landslides; damage to farmland resulting in failed crops; pollution of rivers and coastal areas. The highlands of the Papua Island have for decades been controlled by the US mining corporation “PT. Freeport Indonesia”, contributing to an extraordinary damage to the environment. In addition, mining activities are a threat to the indigenous peoples living on the mountains as well as the lives of the indigenous Kamoro people, who reside along the coast. Coastal areas have been used for years as disposal sites by the company. The Kamoro people have to live with toxic waste everyday. This also affects local food consumption, which has been shown to be polluted by heavy metals. Now, the Kamoro people have to fight again to resist the industrial development plan of the company, which includes a smelter in their traditional territory. The company’s plan is backed by the government. However, the Chief of the Kamoro people has declared that they reject it and that they are ready to stand and fight if the plan continues. The Kamoro people do not want to add more misery to what the next generations already have to deal with: the waste from the industries. In addition to the smelter to be built, the government also plans to build a cement factory and other factories which would further marginalize the indigenous Kamoro community life in Papua even further. Another example is the North Maluku Islands, which are also under great pressure from the mining sector. The “Weda Bay Nickel” project, from the French mining and metallurgical ERAMET group, is causing severe environmental damage and community conflicts, including the criminalization of people by security forces. The Nusa Tenggara Islands are also increasingly pressured by the many manganese mines in the area. This has created conflicts with the indigenous peoples because of the destruction and pollution of their agricultural lands and destruction of their livelihoods. The overall environment of Indonesia will continue to be threatened and destroyed by the mining sector if the government does not immediately conduct a review of all mining permits that have been issued. The companies that will be found guilty of this destruction and that have ignored local communities’ lives must stop activities immediately and be prosecuted for their criminal acts. Besides, the government is issuing at present too many mining permits. Given all the negative impacts all over the country, it is crucial to put a stop to that in order to provide an opportunity for communities and the environment to deal with these impacts, to start a process of rehabilitation of the well-being of communities at all levels, and to recover physically and ecologically the lands these communities used to work on. (1) “Contracts of Work” and “Contracts of Work for Coal Mining” are given by the Indonesian government and are different from mining licences.